Squid also known as Calamari makes a superb appetizer to serve your guests. Whether you are making Squid for the game or calamari for a party it is one of the finest Japanese cuisines so enjoy! Squid also known as Calamari makes a superb appetizer to serve your guests. Squid makes a wonderful tasty stir fry or just serve deep fried in batter. Delight your friends with this quick and easy treat that can be taken as an appetizer to your next party. Watching the game and need something that will satisfy without a lot of effort. Roll the Squid in some batter, fry it up, serve and you'll be the one scoring big. 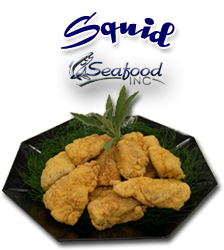 Our Squid comes as raw squid steaks packaged in one-pound gold foil vacuum sealed packs to make as little or as much as you want. Whether you are making Squid for the game or calamari for a party it is one of the finest Japanese cuisines so enjoy! As a fresh squid supplier we ship fresh and frozen squid worldwide. Seafood Inc is dedicated to superior quality of its frozen and fresh squid.